The Fearless Presentations ® public speaking class in Washington DC is a presentation skills seminar that uses the secret to eliminate public speaking fear which is to break presentations into component parts and have participants master each part individually. 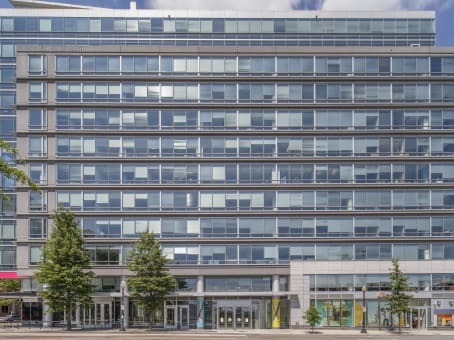 Our office is located at 1050 Connecticut Avenue N.W., Washington, DC 20036. This office opens at 8:30 AM, registration begins at 8:45 AM, and the course takes place from 9:00 AM to 4:00 PM both days with a one-hour break for lunch around Noon. To register for any of the public speaking classes or workshops listed below, just click the appropriate link. If you need additional information before registering for a class, return to the public speaking class locations page and complete the form at the bottom of the page. Washington, DC presentation workshops are scheduled about once every four months. I had an absolute blast teaching a really fun Washington DC presentation class in September of 2017. The presentation class actually had a pretty funny (and embarrassing) start for me. Some of you may know Fiona Dawson who typically teaches our Washington DC Fearless Presentations ® classes. 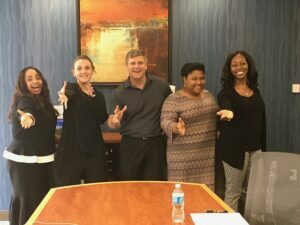 One of our clients hired her to conduct a private class for their employees, so I flew in from Dallas to teach the class in her place. Now, I've been to Washington DC dozens of times, and I'm very familiar with the area. In fact, I was the one who set up our office on I Street a couple years ago. Well, about six months ago, our landlord sold the building, and our our local team moved the office about a mile away. Keep in mind, I've never been to the new office. So, I booked a hotel within walking distance of the new office address. I arrived late afternoon the day before this class. Since I had some time, I figured I'd take a walk to see the office in person, but when I punched the address into my phone, it was showing me being about 4 miles away. I started to get angry, because I specifically picked this hotel to make sure I could walk to the office in the morning, and now I'd have to get ready earlier and catch an Uber. But, in the grander scheme of things, it wasn't a really big deal. I just sat my alarm clock about 30 minutes earlier. The morning of the class, I got up early. Caught my ride to the office. And, even though it took me a good 30 minutes to get through DC traffic, I arrived at the new office about an hour before the class start time. Of course, I have no key to the place, and the elevator wouldn't take me to our floor before 8:30 without a key, so I patiently waited in the lobby. I was a little concerned, because by 8:30 AM, I hadn't seen anyone from our company, and no class members had arrived. (There is always a couple of people who arrive really early.) The elevators finally unlocked, and I made my way to our floor. However, when the elevator doors opened, I didn't see our logo or furniture. It hit me very quickly that I was in the wrong place, and my class members were likely already showing up in the right place! Panic sat in really quickly. I double-checked the address. Turns out that I left off the NW at the end of the address, so I was... wait for it... about 4.1 miles away from the office. Luckily, a passing cab saw me coming out of the business and moved quickly through traffic to get me to the correct address. I ended up arriving for my own class about 2 minutes after the start time. It was so embarrassing. It was particularly embarrassing when I mentioned tip number four in the 10 ways to reduce public speaking fear. That tip says that if you are the speaker, make sure to arrive early so you aren't distracted or pressured before your speech. Man is that tip true! Because of the funny start, though, the group was really able to break the ice early. So, the class was very helpful for all of us! It was exciting to see each person’s unique strengths. One speaker used dramatic pauses brilliantly. Another demonstrated impressive poise and focus. Another used dry humor effectively Several participants used excellent gestures and posture to convey dynamic leadership. This Fearless Presentation class was led by Laura Lewis-Barr at the Hilton Garden Inn, 2201 M Street NW, Washington, DC. 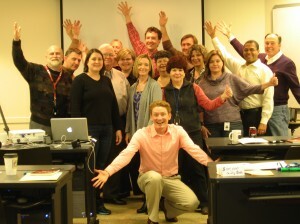 We recently finished another Fearless Presentations ® public speaking class in Washington DC. Class ended on Friday the 13th but we felt very lucky. Five hardworking professionals learned just how talented and fascinating they are! We heard speeches about ways to keep our HVAC systems efficient and long lasting, how pets keep us healthy, how learning proper banking regulations can keep us out of jail, how the HR department can help companies retain employees, and ways to prevent trucking accidents. A day earlier we learned just how many great stories we have hidden inside us. One favorite involved buying thousands of dollars in gift cards to score free travel perks. 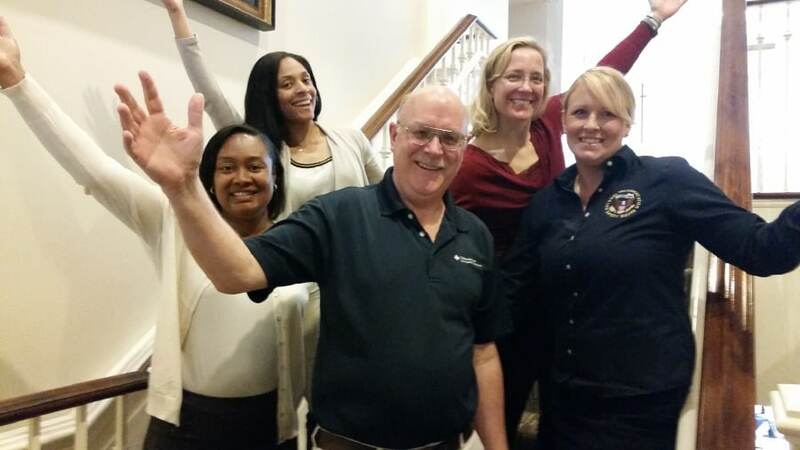 Federation of State Boards of Physical Therapy hosts Fearless Presentations ® class in Washington, D.C.
Federation of State Boards of Physical Therapy decided it was time to sharpen presentation skills by hosting the Fearless Presentations® class on site in Washington, D.C. 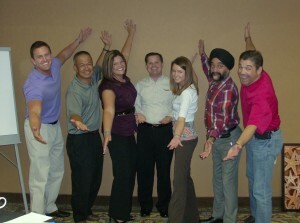 This was a lively group of 15 people with various levels of experience delivering presentations. In this particular class, there were a couple of people who were very nervous about getting up in front of their peers to present. Public speaking fear is very common and is listed as one of the top five fears of most Americans by the Book of Lists. In this public speaking class, participants are given a number of tools to work with to overcome this fear and, as a result, feel better about their presentations. For the more seasoned presenters, a number of techniques are covered to provide ways to keep presentations interesting for both the presenter and the audience. By getting up repeatedly in front of the group to practice, these tools become ingrained in a very short amount of time. Techniques such as adding stories, analogies, quotes, and flip chart drawings are also covered in the class. If you feel that presentations could be better at your organization, the Fearless Presentations® class is a great way to make participants feel more confident about their abilities, and leave audience members associating your company with outstanding presentation skills. 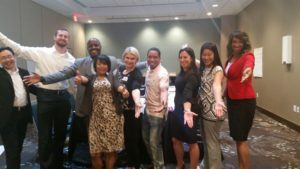 Classes are offered in Washington D.C. and throughout the U.S.
A great group of people met in Washington DC to overcome their fear of public speaking and to improve their presentation skills. One of the key learning points for the group was understanding how important energy and enthusiasm is to a presentation. There is an old saying that, “people will not get excited about your presentation unless the speaker is excited.” This is a very true statement. If you can’t be excited about your topic, then you can’t expect anyone in your audience to get excited. I hear many people in our Fearless Presentations ® Workshops tell me all the time that they are accountants or engineers and that “there is nothing exciting about explaining what they do.” It’s important to understand that if the process that you are explaining isn’t exciting, then the results should be. I remember a student told me that she sold accounting software. Now, I have to admit that there isn’t too much excitement explaining why a company should stop using their software and start using your companies. But, when I asked her what made her software better, she said that once their software was completely utilized, the average data entry person could save, on average, 4 hours a week because they wouldn’t have to make duplicate entries. I don’t really understand what that means, but I can get excited about having an additional 4 hours a week to work on important tasks. This is where the results are what you get the customer excited about. So, next time you feel like you’re having a struggle with enthusiasm your topic, ask yourself, what the benefit of the Result is. You should be able to get excited about presenting a great solution to even the non-exciting issues that they face.